Although the calendar tells us that spring is not quite here, and the weather as I write this is fully winter, harbingers of warmer weather are beginning to appear in the landscape. Most of us thrill to see the various fruit trees break forth in bloom – plums, followed by pears, peaches, almonds and finally the apples. However, there is a native Californian that puts on an even more dramatic spring display than the imported and cultivated ornamental fruit trees: the Western Redbud, or cercis occidentalis. It is just coming into bloom in Sonoma County in March. Grown as either a large shrub or a small, multi-trunked tree, a blooming Western Redbud is one of the most dramatic of California natives. Its deep, vibrant, magenta blooms seem to ‘hug’ the branches, since the flower clusters are either stalkless or borne on short racemes. Thus, the effect that a blooming plant produces is more angular and geometric than the typical blooming tree or large shrub. Although the flowers are the most dramatic and striking part of the plant, the leaves are also quite beautiful – kidney shaped and bluish-green, they provide a lovely garden backdrop to summer-blooming plants. Finally, when autumn arrives, the leaves turn an attractive shade of yellow. Once they fall, the long, maroon, flattened seed pods become visible, providing a nice decoration in the late-season garden. Why is cercis occidentalis a good choice for Sonoma County gardeners? Because in addition to its good looks, it has good garden personality, too! As a California native plant, it is a thrifty water-user. 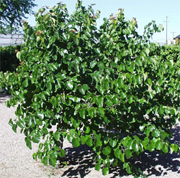 Unlike those fruit trees mentioned earlier, which require regular irrigation for the entire dry season, Western Redbud can get by on much less water. Occasional waterings during the dry season will keep it happy, with a bit more in the hottest inland areas, less near the coast. In my mild Petaluma garden (I’m on the East Side and slightly elevated, so my garden has significant coastal influence) I have my c. occidentalis on an infrequent drip system and they do just fine. Alternatively, you can remove any regular irrigation once the plant is established, and just give it a good soaking every few weeks during the summer and autumn months. Western Redbud is also a good garden choice because of its attractive shape and size, which do not require much, if any, pruning or maintenance. If left unchecked, it will eventually grow to approximately 12-20’, which is a manageable size for most gardens. If you wish, you can prune off the lower limbs, which will cause it to become more tree-like in form, although it will never lose its multi-trunked architecture. It likes full sun, though can take a bit of shade, and will tolerate most soils, especially if, like most California natives, it has good drainage. Western Redbud makes a striking specimen planting, especially in the smaller garden, especially if it is placed where you will appreciate the full impact of the spring bloom. In larger spaces multiple plants make a dramatic clump or part of a chaparral planting. I have a hedge of arbutus unedo, another California native, along my driveway, chosen because of its evergreen leaves and dense growth habit (I needed a privacy screen). However, for dramatic effect, every so often I stuck in a cercis occidentalis. In spring the magenta-clad bushes seem to leap out of the glossy green background. I also have several in the back of mixed borders. There is a white-flowering variety of Western Redbud: cercis occidentalis ‘Alba’. It has the same growth characteristics as discussed above, except that the branches are coated with snowy white flowers in spring, rather than magenta. It is much harder to find than c. occidentalis – I got mine mail-order from Forest Farm Nursery in Oregon (www.forestfarm.com). While Western Redbud is easy to grow, it is susceptible to verticillium wilt, as are other members of the cercis family. This is a fungal disease that usually enters the plant through the soil, although it can also enter through wounds in the bark. Once in the plant, it spreads through the vascular system, eventually causing the entire shrub to ‘wilt’ or die. There is no cure for verticillium wilt, although keeping the plant healthy and pruning off affected parts of the shrub (well below where disease is evident) will extend its lifespan. A Redbud that is showing signs of verticillium wilt should be watered and fertilized a bit more than one that is healthy. I have lost a couple of plants over the years to this disease, but most have not been affected. The cercis family is quite large, with c. canadensis, the Eastern Redbud, and its varieties forming the majority of its members. While many are lovely, they typically do not adapt as well to our western gardens and show much less tolerance of our soils and dry summers than does c. occidentalis. If you want to see Western Redbud in bloom, drive along 101 in mid-March, especially in the mid and northern parts of the County, where it is planted in profusion. It is especially striking on the sides of Interstate 5 north of Sacramento. Western Redbud is available at many nurseries throughout the County, typically in five and fifteen gallon sizes. I most recently saw it at Urban Tree Farm in Fulton.